Again, this was first published on my work blog - sorry if you've already seen it. I'm posting it here too because I think knitters might be interested. 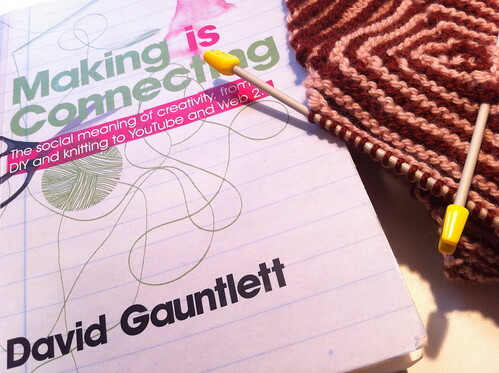 I've mentioned David Gauntlett's new book, Making is Connecting, a few times recently: on my work blog, my knitting one, and on the Guardian's Notes and Theories. It's an interesting book worth talking about. It's about the social meanings of creativity and 21st century maker cultures, be these makers of blogs, woolly cardigans, cupcakes, podcasts or physics-themed lolcats, and in particular the changing structures of making which surround what is sometimes called ‘social media’. As any seasoned media studies scholar will grump at you, all media is social, but with this thing we call web 2.0 the patterns of sociability are changing (Gauntlett has made a lovely vid on this) in ways which are wrapped up in the history of crafting. One of the key frames of the book is a shift from the passivity of the ‘sit back’ model of what might come to be seen as the odd mid to late 20th century era of the television and towards a culture dominated by ideas of making and doing. People who watched British television at a certain point in the late 20th century may remember a show called Why Don't You Just Switch Off Your Television Set and Go Out and Do Something Less Boring Instead. So does Gauntlett. I wondered at times whether this shift is over-stating in the book. Or at least that I we should be careful of putting them up against each other in terms of making. I love the passivity of some TV shows because they free me to knit in front of them (just knitting on its own doesn’t catch my attention enough). Or what about TV shows that draw on crafting cultures? (food TV, especially in the USA is fascinating here). Moreover, there are ways in which that big smooth professionally oiled machine of big media acts as a material for 21st century craft. One of the striking, not always appreciated, aspects of 21st century making is how much of it is re-making. Fan fiction is the classic case study of the complexity of such remaking culture. Take, for example, Constance Penley’s book NASA/Trek where she writes about people re-working the stories of Star Trek just as they also rework the various stories surrounding NASA. A smaller topic, but equally interesting I thought, was that of mess. Gauntlett mentions this first when he is introducing web the notion of web2.0 and mentions a video from Chris Anderson, and then comes back to later when discussing the Jaron Lanier's book You Are Not a Gadget. It reminded me of my friend Felix’s great idea (a few years back now) of ‘messy Tuesdays’. Inspired by the ways in which some knitting and cooking bloggers seemed to be self-consciously styling their domestic lives to look like a glossy lifestyle magazine, Felix wrote up a manifesto (currently offline): ‘You are not your flawless surfaces. You are not your orderly laundry-pile. You are not the seamlessness of your Finished Objects. You are not your risen cakes. You are not your sewn-in ends’. As another blogger, Lara put it, ‘as someone who spent her teenager years wrapped in teenage angst about not being clever enough, pretty enough or thin enough, the idea that my home won't be beautiful enough, my craft not so well executed or my knitting up to speed has been at times quite tough’. They confidently posted about the less tidied-up bits of their lives, celebrating the beauty and reality of the mess that surrounds us all. I sometimes think we should bring that back: #messytues has something on a twitter meme about it, no? I also think there’s potential for some research here. John Law is good on this topic, as a post on the ‘serendipity engine' reminded me recently. Although I’ve just quoted a couple of knit-bloggers, I think this idea of the reality, necessity and even beauty of mess has something to say about the way we tell science stories too (as the reference to Law may signal). That’s one of the reasons why I referred to NASA/Trek. There are many other better works on fanfiction (e.g.) but I think Penley’s discussion of something as intrinsically ‘big science’ as the space race says something about the social arrangement of makers in late modern society. There is a danger that by focusing on the ways people make and remake some objects we further 'black-box' others. 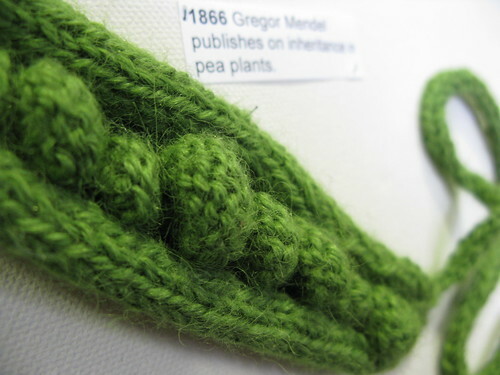 For example, I learnt how to knit from reading knit blogs. I can make a jumper. I can also blog about this on the super clever iphone I carry around with me. I don’t know how to make an iphone though, or even spin my own wool to make that jumper from. The latter is largely a matter of choice (I do at least know some blogs that’d teach me to spin and even what plants to grow to make my own dyes from, as well as a few people who have access to sheep for wool, or possibly even a llama). For the former though, I have no clue where to even start teaching myself, even if I did, the manufacture of an iphone is not exactly opensource. Most of the time, I’m ok with that cluelessness, it frees me up to be knowledgeable about other things, but it does also disempower me. To conclude, I do want to stress that Making is Connecting is a lovely book, not least because of Gauntlett realistically optimistic approach. Though he’ll happily call ‘rubbish!’ (his 10 things wrong with the media ‘effects’ model is justifiably a classic), he doesn’t wear an ability to be ‘critical’ like it's some sort of pin badge to show membership of the ‘very clever thinkers club’. Academics should be able to say they like things, and I like this book. I’ll end on a positive note, an honest one, and say if you are a maker of any sort, I can wholehearted recommend Making is Connecting. It’ll give you a chance to think about the history and philosophies of crafting cultures. It’ll lift you out of your own maker microculture to help you ponder your wider context. It inspired me to make this post, and others, and to think more about my making. So do read it, even if it does take you a few months to get around to finishing it because you keep putting it down to do something else instead. This is cross-posted from my work blog, apologies to the few weirdos who read both. There seems to be more and more events happening which I can only describe as science-craft. I thought I'd write about it, and did a post for the Guardian Science blog. There are overlaps here with sci-art projects, just as there are overlaps (sometimes problematic ones) between arts and crafts more generally. However, I think science craft events have the potential to involve new and different communities which sci-art doesn't necessary reach, and to be more participatory in their whole project set up too. There is the question of what you participate for exactly: what are you making? At danger of repeating myself, science communication isn't all about baking a cake shaped like a neuron. In particular, I worry that the fluffier ends of sci-craft might act as a distraction from the production of more politically controversial outcomes. At a knitting evening held at Hunterian Museum a few years back, I ended up sitting next to a homeopath. As well as swapping tips on the best way to bind off for socks, we discussed our own research projects, including the ways in which they might be seen to clash, and some of the items of the history of surgery that surrounded us. Other people listened and joined in, before we all moved on to complaining about estate agents. It was polite, humorous and thoughtful. It was also pleasingly mundane; something that we’d all do well to remember a lot of science is. To give another example, I spotted this video of a neuroscientist, Zarinah Agnew, making a giant sandcastle. She told me she wants to do it again, but as a workshop rather than a film. I like this idea, because the time spent making the sandcastle allows space for social interaction which simply watching the film might inspire, but won't necessarily do in itself. Not all public engagement can or should have an obvious political or scientific outcome. Whether you want to open up the governance of science or increase the public understanding of science, you are unlikely to get anywhere without quite a bit of cultural change first. 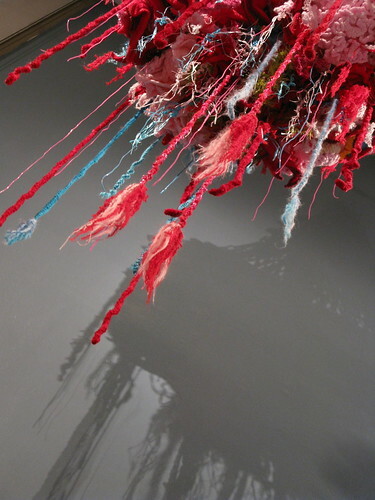 Playing with a bit of yarn might seem unambitious, but arguably the social interaction and reflection that comes with it can help us get there. Or this social interaction might lead us somewhere else entirely. I few weeks ago, I posted about a DNA-themed scarf I'd knitted for a friend of mine. As it was the seventh time I'd knitted that scarf, I took the opportunity to think less about the yarn and needles, but the social relationships the making and sharing the scarves and the pattern reflected. Here's another, different, DNA-themed piece. Again, I want to reflect on the social connections this pattern reflects, because I think it's important. It’s a cardigan for a baby. The baby’s father is a science writer (another one) who is especially interested in genetics, so I used the cable pattern from June Oshiro's famous DNA scarf. It's a lovely pattern, with a lovely story behind it. In many ways, it inspired both my DNA illusion pattern (googledoc link) and the cosmic radiation scarf I made for my PhD supervisor. I've thought about knitting Oshiro's pattern many times, but just never got around to it. The crafting of this cardigan reflects my friendship with the new baby’s parents, but it also reflects a sort of parasocial relationship with Oshiro (as in, I’ve never met her and doubt she knows who I am, but I feel as if I know her, as I know odd bits about her life through her blog). Beyond that, it reflects the relationship Oshiro had with a colleague who challenged her to design that scarf, over a decade ago now. Indeed, it reflects decades and decades of scientists connections with each other and broader popular culture. In many ways, the image of the double helix has become part of popular culture, or at least parts of public culture. That's one of the reasons so many people knit it. The book behind the cardigan in the photo is about this issue, and I guess my desire to knit the image reflects the fact I've studied this as a sociology undergraduate. I used to work in the Science Museum, and would walk past the 1953 Watson and Crick model they have on display there a couple of time a day. So I have an odd set of personal and professional relationships with it too - ones that are different from the relationship a geneticist would have - and have seen people from all over the world stop and think through their relationships with the icon of the double helix as they stop by the exhibit too. Back to that baby cardigan. It's actually a mash-up of two patterns, as I also used Elizabeth Zimmerman’s 'February baby cardigan' as the basic garment. 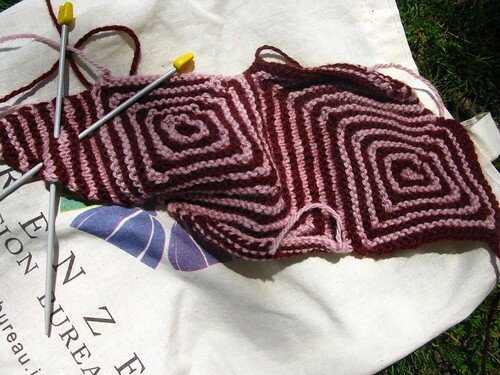 Thus, it reflecting an older and broader set of connections to knitting communities, as well as, more personally, a connection to my friend Kirsty who gave me a book of Zimmerman patterns for my birthday a few years ago. In terms of my use of both patterns, crafting this piece also reflects various other social connections, of varying degrees of tangibility, throughout the online knitting community as I’ve tracked other uses of these two patterns. 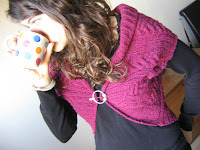 Now I’m sharing it with you – and on ravelry – it reflects another set of connections, and opens itself to further possible ones too. What am I knitting. Where am I knitting? My latest work in progress, can you guess what it is yet? It's going to be a scarf, based on the Step Up afghan from Woolly Thoughts. The pattern is the sort of super-logical and efficient-as-possible one I love. There's lots of picking up stitches, knitting one shape into another, and rules like all triangles are stocking stitch, or vertical parallelograms have garter stitch light-coloured stripes. I'm still getting to grips with these rules, but am getting there. 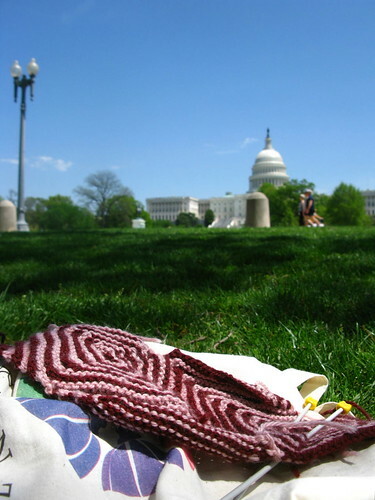 Rather than what am I knitting, a better question might be where am I knitting it? Ignore the old bag from a conference in Florence; that's a red herring. I'm in DC for a couple of months, visiting faculty at American University, School of Communication. I'll also be spending a bit of time in New York, Philadelphia, Chicago, Toronto and Ottawa while I’m here. 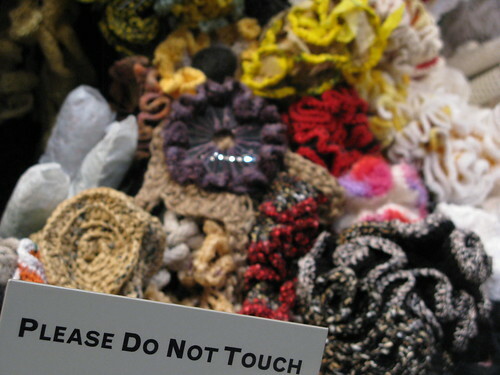 Any don't miss knitting things to do, people to see, yarn to squeeze? (don't think I can make Maryland Sheep and Wool). 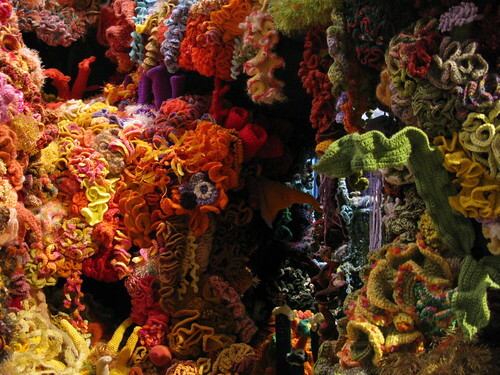 I just managed to catch the last day of the Crochet Reef display at the Smithsonian Museum of Natural History on it's last day. Best two overheards there: "it's not coral, it's made of sweater stuff" (but in a tone of "and OMG that is awesome") and "it wasn't just one person you know, it was loads of people, it's a community project" (again, clearly the speaker thought this was the best bit. I agree). Here's a picture of my friend Ed wearing a DNA illusion scarf I've just knitted him. Ed's a prolific and highly respected science writer (he blogs at Not Exactly Rocket Science). He recently included me on a list of top science bloggers, and I joked that if he wanted me to knit him a scarf, he only need ask. I was serious too though. I appreciate the work Ed does, but I get to read it for free. Though he does get paid for much of his writing, he also puts a crazy amount of hours in. Knitting him a scarf was a way of saying thank you. Illusion knitting is notoriously hard to photograph, so you might have to have a look at the video in this post to really get how the trick really works. As I've said before, DNA and illusion knitting seemed to be made for one another. The ladders of the striping pattern twist round those of the helix as purls and knit-stitches collect to display a regular shape. I also like that you have know how to look at the scarf to really see the pattern. There's an "OH!" moment when you spot it. Symbolic of the science it reflects, the pattern isn't self-evident. Presenting Ed with the scarf in the pub last night it was great watching other people respond to it too, and holding it up to the eyes to spot the illusion. I think this DNA illusion pattern is the knitting project I'm most proud of. It's not so much the product (though I do like the way it looks) or the process of knitting it (though I do enjoy illusion knitting). Rather, it's the social connections that making this scarf has either reflected or helped create. I'm currently reading a new book about the social dimension of craft - Making is Connecting - so I guess this is on my mind at the moment. The first one I made was for an ex-geneticist friend, as leaving present for work. I'd only recently learned to knit. Flatmate Kirsty had adapted the alien illusion scarf for her brother, with a picture of Che Guevara. I thought I'd try something similar, and that a design reflecting the iconic double helix would work really well with the illusion pattern. Then I made another for a scientist/ knitter friend in New York, and wrote up the pattern to share. Then more started popping up. I've had emails from all over the world about the pattern. I've knitted the design into some socks for a science-teacher friend for his birthday, then as a baby blanket for a cousin, and then again as a scarf for a friend when she finished her PhD. I finally made one for myself too. A journalist from UK Wired emailed me and it ended up being mentioned there and it featured on this post on science-knitting. I swear I once spotted someone on the street wearing one (I was on the top deck of the bus at the time so couldn't run up to her and check). 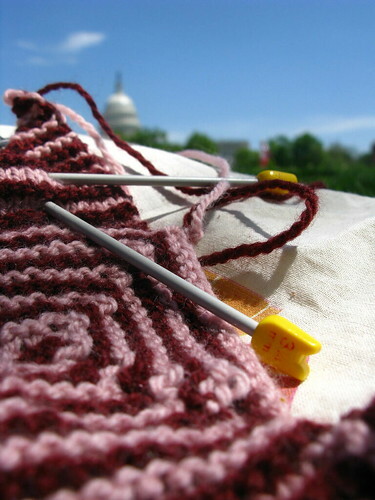 The project is ravelled here if you want to see details of yarn, needles and mods. The pattern is available or through googledocs, or via ravelry.